A year and a half after President Obama loosened restrictions on government funding of human-embryonic-stem-cell research, a federal judge on Monday, Aug. 23, declared all such studies temporarily off-limits for taxpayer dollars, on the grounds that they violate a 1996 law. The decision could be a devastating step backward for a promising new science that has the potential to generate new treatments and possibly even cures for diseases such as diabetes and Parkinson's  and the reaction from scientists was swift and blistering. "The court decision threatens to impede progress in regenerative medicine in our country," says Dr. Elaine Fuchs, a professor at Rockefeller University and president of the International Society for Stem Cell Research. "It must be challenged as quickly as possible." A statement by Dr. Alan Trounson, president of the California Institute of Regenerative Medicine, which directs $3 billion in state taxpayer funds in the field, was more succinct: "The decision is a deplorable brake on all stem-cell research." Even in labs in which the decision does not represent an absolute brake, it's surely a sharp turn. After reading the judge's opinion, Dr. George Daley, director of the stem-cell-transplantation program at Children's Hospital in Boston, instructed his team to assume that no federal money is permitted for studying human embryonic stem cells and to use only privately funded equipment for its work. "I read the injunction, and it seems pretty clear to me that we can't use any federal money for any of our human-embryonic-stem-cell work," he says. Ruling on a lawsuit filed against the National Institutes of Health (NIH), U.S. District Judge Royce Lamberth declared that research on human embryonic stem cells violates the Dickey-Wicker Amendment, a 1996 law that prohibits federal dollars from being used to support any studies "in which human embryos are created, destroyed, discarded or knowingly subjected to risk of injury or death." 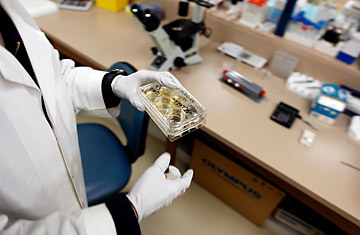 In order to obtain stem cells, the four-to-five-day-old embryos from which they emerge are sacrificed. The NIH currently lists 75 human-embryonic-stem-cell lines that are eligible for study with federal funds. These lines originated from excess IVF embryos that were donated for research with consent from the couples who created them. Experts believe that these cells, which can develop into any of the body's more than 200 different cell types, could become an important source of healthy new cells to replace diseased ones, as well as a window into the processes by which diseases occur. The registry, along with Obama's decision in March 2009 to allow taxpayer dollars to be used to study any existing embryonic-stem-cell lines that meet NIH ethical guidelines, is allowed even in the face of Dickey-Wicker because of a 1999 ruling by Harriet Rabb, then counsel for the Department of Health and Human Services. Rabb determined that human embryonic stem cells, which are derived from embryos, are not the same as embryos and therefore are exempt from the funding prohibitions of Dickey-Wicker. As long as labs used private funds to derive the stem cells from the embryos, they could then use federal funds to work with the stem cells. Separating the creation of embryonic stem cells from their study was a solution that scientists saw as a logical and reasonable interpretation of the law  but that religious conservatives and pro-life groups viewed as merely semantics, untenable on legal grounds. That was the impetus behind the suit, filed by, among others, scientists who support the study of adult stem cells, which do not require destruction of embryos. Also backing the suit were the Christian Medical Association and Nightlife Adoptions, a group that helps couples adopt embryos donated by those undergoing in vitro fertilization. The pro-life groups cited concerns over how embryonic stem cells are obtained. If embryonic stem cells are the product of the death of an embryo, they maintain, then federal funds cannot and should not be used to study them, even if the actual act of obtaining them did not involve taxpayer dollars. The scientists working with adult stem cells took a somewhat surprising position  one that was more economic than ethical. Continued government support of embryonic-stem-cell studies, they argued, would put them at a disadvantage in the competition for scarce grant dollars, especially because adult stem cells are less versatile than the embryonic variety, able to yield only a limited number of new cell types. The suit was dismissed last year, but a Court of Appeals decision revived the case, reversing the ruling. Lamberth agreed with the plaintiff's case, noting that "the question before the court is whether [embryonic-stem-cell] research is research in which an human embryo is destroyed. The court concludes that it is."